Whether it’s an AI-powered chatbot or a chatbot with voice assistant, intelligent virtual assistants (IVAs) have already made their way into our personal lives. What’s even more interesting is the pace at which they are being adopted across enterprises and industries, and how they are transforming the various business processes in turn. In a recent Gartner Report, “Business and IT leaders are stepping up to a broad range of opportunities offered by AI chatbots.” AI-powered chatbots will improve technology in our enterprises and homes. In a report titled Predicts 2017: Artificial Intelligence, Gartner claims that IVAs, also referred to as chatbots, will play a crucial role in improving IT Service Management (ITSM) processes. IT service desk is the shared services organizational unit responsible for (ITSM), handling IT system/application, hardware/asset related end user support on processes, policies, incidents/issues, service requests, and knowledge requests. Being a cost center function, this unit has to manage SLAs under stringent cost control. ITSM has become a key area where organizations have started investing on automation initiatives with the use of AI and chatbots, in order to bring down operating costs, enhance work productivity and cost efficiency, improve end user self service capabilities and usage experience, and speed up resolution of issues and knowledge queries. 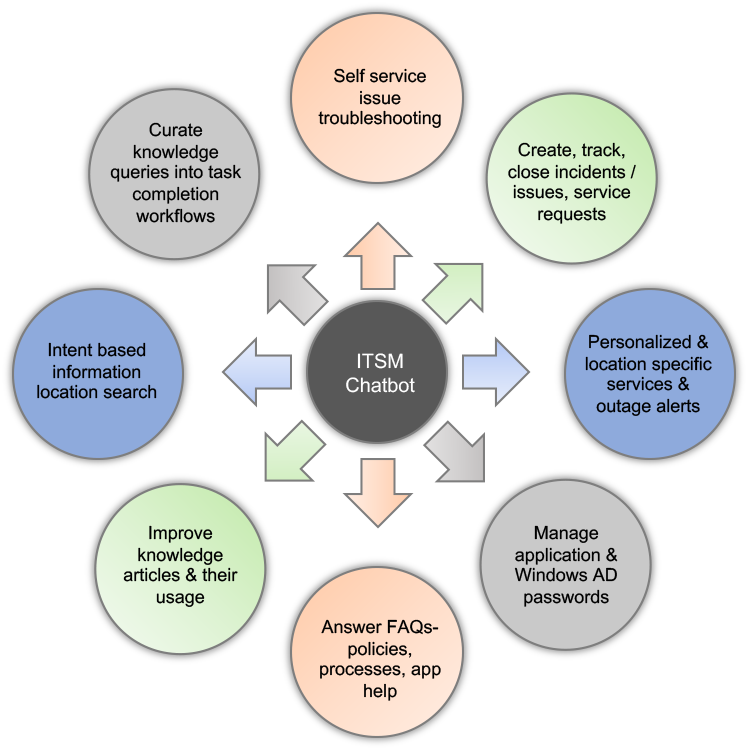 The following illustration outlines the key use cases that have the most traction in ITSM chatbot programs across customers, enabling faster value realization and payback from investment in conversational AI technology. These use cases can be enabled for most part/all of the IT service catalog hierarchy (Category, Sub-category and service) for both business (like CRM, ERP, Reporting tool, etc.) and non business applications (Browser, chat messenger, email, etc.). For scenarios like issue troubleshooting, bot can help avoid/reduce the number of incidents raised to IT Service desk by identifying the issue (map it to a pre-defined intent configured for the issue) via natural language chat with the user and presenting a series of steps, one-at-a-time for the user to execute in order to analyze/diagnose and resolve the issue. If the bot is unable to map user intent to an existing issue with troubleshooting information or if the issue is still unresolved after the user executes the steps, bot can transfer the chat session to an IT service associate on live chat, by transferring control to the live chat application (like ServiceNow Connect Chat, LiveChat, Liveperson LiveEngage, etc.,). What this means is, the end user is now connected to a human associate who can chat in his own live chat interface (provided by the chat application), and can see these chats in his chatbot interface. When the end user replies or asks a question in the chatbot interface, the live chat associate can see the messages in the chat application interface. Before the chatbot transfers control to the live chat application, it can transfer the chat history to the chat application (for the associate to look at the issue, troubleshooting steps already executed and any root cause analysis already done). After the live chat session is over, the chatbot can take back control from the chat application based on a set of business rules. The above scenarios in the chatbot can be achieved via a combination of API/ service calls to backend apps (provided there are APIs for the required use cases) and csv based data - Q&As and troubleshooting steps. The blog has been written by Abhiroop Roy, Director- Solution Delivery at Kore.ai. Read his blog on LinkedIn. (Views expressed are personal). If someone is exploring ITSM chatbot deployment or building a business case for chatbot for organizational needs, please reach out to him at abhiroop.roy@kore.com.